Very bizarre, but I’m loving baths at the moment – despite it being mid-Summer. I can put this down to the horrendous weather we are having – it feels pretty much like winter. Apologies for the generic picture. Anyway, last week I popped into the Superdrug store on Charing Cross Road to try and find Epsom salts (still not managed to find them in store anywhere – so ordering online) and instead picked up a couple of bath products. 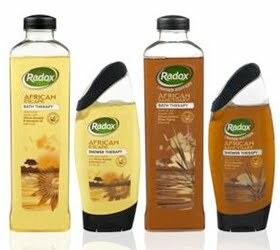 I came away with a bottle of Radox LE African Sanctuary Bath Therapy (the brown one on the left). It smells AMAZING, the main thing I pick up is green tea – I love this scent – creates loads of bubbles and is generally lovely. Plus it only cost £1.50ish – bargain. The salts also cost around £1.50 – love a bargain. On the same trip I also got some of those exfoliating gloves – I have had a few pairs of these before and it’s tough to find something that does a better (or cheaper) job of exfoliating. Ooh, thank you. I have no idea why Epsom salt is so hard to find!? I’m sure it used to be easier! I may have to pick up the shower gel – love the smell so much!